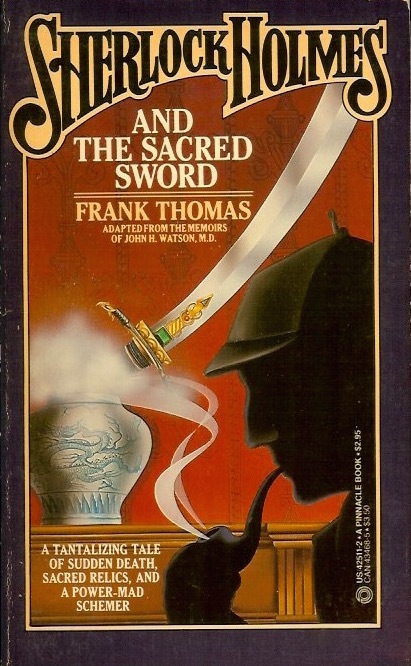 First published in 1980, this original Sherlock Holmes adventure by Frank Thomas seems to have anticipated Indiana Jones. This Pinnacle paperback was published in 1985. This bizarre sequence of events propels Sherlock Holmes and Dr. Watson to the back canals of Venice, the shadowy world of Berlin, the lurid alleys of Cario, an the Valley of the Kings––in search of the sacred silver sword and the false prophet who may trigger a holy war in the Middle East, unless the dauntless Holmes can bring the scoundrel to ground and halt his fiendish scheme!